Nasser Al Attiyah won a record 14th MERC title. Qatar driver Nasser Al Attiyah won the MERC Kuwait Rally in a Ford Fiesta R5, winning the FIA regional Middle East Rally Championship for the 14th time. This makes him the most successive driver in the history of any regional rally championship. He overtook the record of Mohammed Al Sulayem, who had previously won the MERC title 13 times. Al Allayah’s final remaining challenger was the Czech driver, Vojtech Stajf, who was delayed on the first day when he rolled his car, damaging a suspension damper. All six FIA regional rally championship this year have now been decided. The only major rallying titles outstanding are the Drivers’ and Manufacturers’ titles in the World Rally Championship. 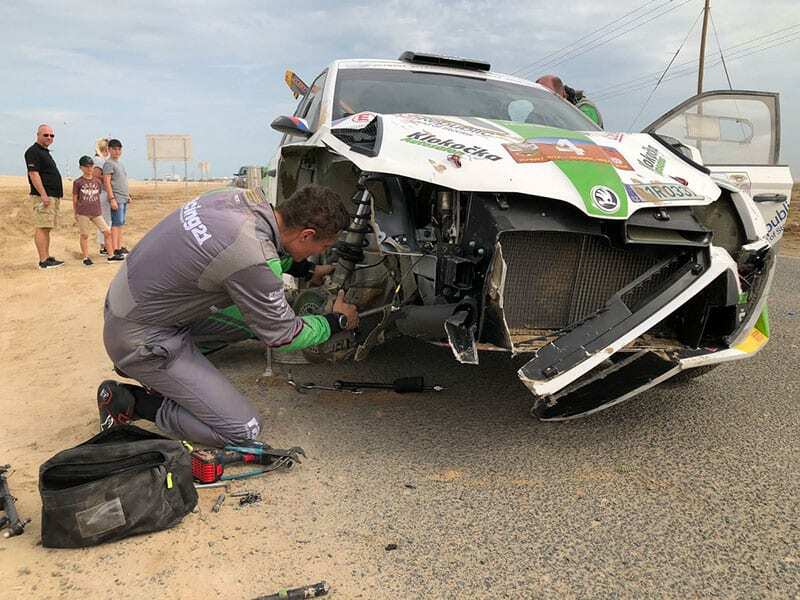 Vojtech Stajf was delayed on the first day when he rolled his Skoda. 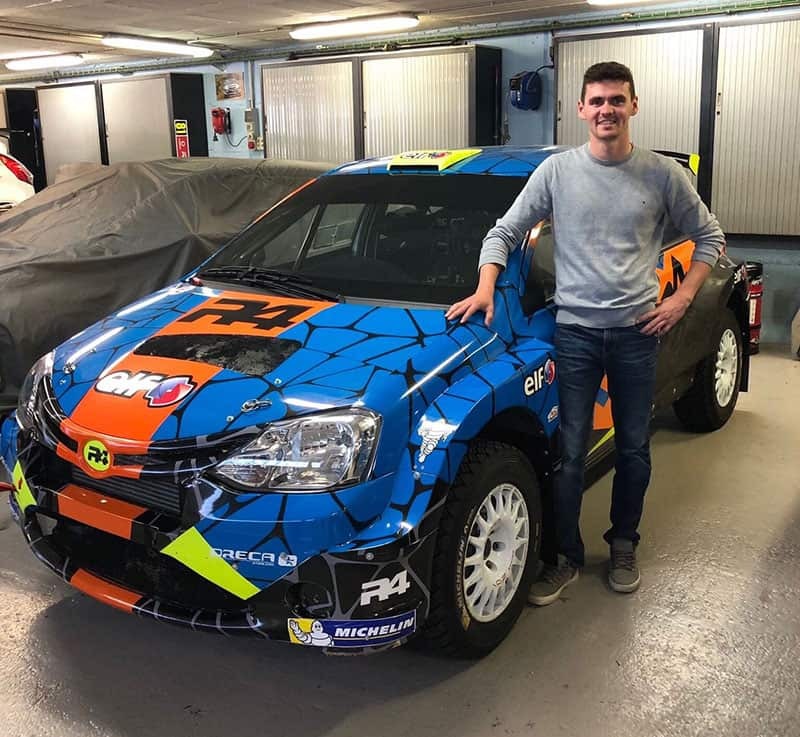 Second place on the Spanish gravel championship Rallye Ciudad de Granada was taken by Welsh driver, Osian Pryce, making the first competition appearance of a R4-Kit car, in this case a Toyota Etios. Four times champion, Xavi Pons, took his sixth outright win in the series this year in a Skoda Fabia R5. Different types of car complying with four different categories (R5, R4-Kit, N5 and WRC) finished in the top five places. Osian Pryce and the R4 kit car. The FIA Central Rally Trophy Lausitz Rallye was won by Fabian Kreim, with fellow Skoda Fabia R5 driver, Matthias Kahle, second and Czech Fiesta R5 driver, Jaroslay Orsak, third. It was a bad week for Kris Meeke. Plans for a quick test in Finland with a Yaris WRC fell through when 20-25 cm of snow fell on the region where Toyota Gazoo Racing have their dedicated test zone. Then he went to Belgium to compete on Rallye Condroz-Huy in a Skoda Fabia R5, but on the fifth stage his engine failed when he had been lying in third place. Sadly on the next stage, the Skoda R5 of Steve Matterne and Rik Vanlessen crashed into a roadside pole, taking the life of the co-driver. Toyota Mirai cars won the third e-Rallye Monte Carlo with three hydrogen fuel cell cars finishing in the top six. The event is aimed at vehicles which create minimal emissions and is a qualifying round of the FIA’s Regularity Cup for Electric and New Energy cars.